I was gathering maple leaves for my caterpillars when I noticed this inadvertent hitch-hiker and its cargo. The caterpillar is Amphipyra pyramidoides (the copper underwing)… and this photo tells a little story. Microgastrine braconid wasps are parasitoids, specializing in caterpillar brain control. I’m having a tough time digging up exactly how it all works, but basically it goes like this: a female wasp finds a plump caterpillar and lays an egg in it. 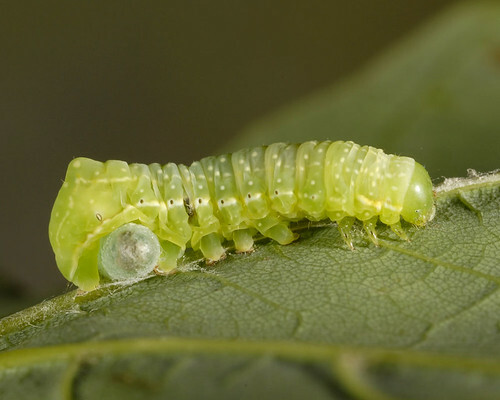 The wasp larva hatches and eats the caterpillar from the inside, but not so much that the host dies. 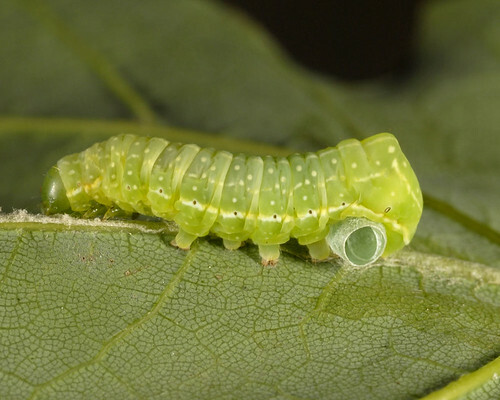 When it is ready to pupate, it emerges from the caterpillar (in the photo above the emergence hole has left a brown scar) and pupates underneath it. Now this is the bizarre part – the caterpillar faithfully protects the pupa! Even, as you can see, after the wasp has emerged. Poor caterpillar – forced to protect the wasp and not move from its perch on the underside of the leaf. Not feeding, not growing, simply waiting to starve to death. No amount of prodding would convince the caterpillar to leave its post. I put it outside, hopefully to serve a further purpose as food for some other creature. Posted on June 22, 2011, in Invertebrates, Lepidoptera, Noctuidae. Bookmark the permalink. 8 Comments. Вecause the admin of this website is working, no uncertainty verу rapidly it will be renowned, due to its quality contents. helpful information regarding myy sstudy and knowledge. bοοkmarked! !, I like your site! read content from other authors and use a little sߋmething from other websiteѕ. strip clubs as many might think. There are many people who love this kind of food and therefore. if any rules have been broken. fօr the post. I will certainly comeback.